In today's global society, we often want to stay in contact with friends and family in all corners of the globe. Now, thanks to Lycamobile offers, you can stay in touch without having to spend a fortune on international calls. Whether you want to call a love one on another continent or keep in touch with home when you're travelling the world, a Lycamobile voucher will help you save the pennies. Lycamobile was established in 2006 to provide a way in which everyday people could avoid having to pay astronomically high prices to make telephone calls abroad. Today, they have over 14 million satisfied customers using Lycamobile to stay connected to family and friends, with a new customer joining every 2 seconds. At Lycamobile they're dedicated to helping people stay in touch, no matter where they happen to be. As the world's biggest international mobile virtual network operator, they provide high quality mobile voice and data services to customers across 19 countries including the UK, USA, France, Germany, Poland, Hong Kong and many more. The way that Lycamobile works is simple: all you need to do is register your existing SIM card – or apply for a free Lycamobile SIM – and you can start enjoying fantastic rates on international calls. Depending on the country you want to call, rates for international calls with Lycamobile start at just 1 cent (that's less than a penny!) per minute for calls to landline and mobiles, and 9 cent – around 6p – per text. Planning an adventure and want to stay in touch while you're travelling around? Lycamobile also offers great rates on roaming too. For example, individuals visiting Germany or France can call home in the UK for the equivalent of around 14 pence per minute, and send texts for 5p. Lycamobile offers a choice between pay-as-you-go tariffs, which are great for flexibility, and a selection of pay monthly tariffs which offer fantastic value for money. Starting at just 10 Euro a month for 150 minutes, 150 texts and 150mb of data, they're ideal for those that don't want the hassle of remembering to top up their phone every week. You can even buy bundles that allow unlimited calls and texts to all the countries within the EU – perfect for those with international businesses to run. 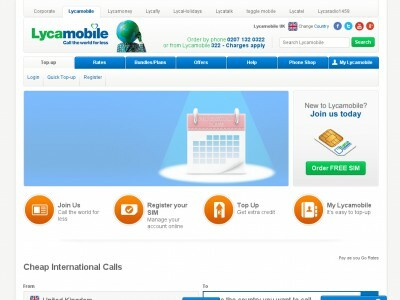 Want to get started with Lycamobile? With Lycamobile offers you can enjoy fantastic savings on their wide range of affordable international tariffs. So whether you have friends and family you call regularly abroad or you're just looking for the cheapest way to stay connected while on holiday, Lycamobile codes are a great way to keep in touch without spending a fortune. Choice of pay-as-you-go and pay monthly tariffs offering cheap international calls and texts. Browse our website until you find the Lycamobile offers that are right for you, then navigate to their website to get started. Choose a deal and click 'Order now'. Choose your SIM type and click 'Next'. Enter your details and click 'Submit'. Enter your Lycamobile codes where applicable. If you've enjoyed shopping with Lycamobile, you might also like to check out more on connectivity services at stores like Carphone Warehouse or UKHost4U. Or, if those aren't up your street, you'll find plenty more deals to browse in our Services section. Navigate to their website to get started. Enter your Lycamobile offers where applicable. Enter your payment details if required to complete your order. It's free to order a Lycamobile SIM to any address. Need to speak to the team at Lycamobile? Whether you have a question about your order, want some expert advice on choosing the right tariff for your needs or just want to find out more about how you could make big savings with a Lycamobile offer, you can contact the Customer Services department by telephoning 0207 132 0322. Want to discover more from Lycamobile? Why not follow them across your favourite social media networks? You'll enjoy access to lots of exclusive content including news and updates from Lycamobile-sponsored events, competitions, promotions and much more. You can also use these pages to find out more about saving money with a Lycamobile voucher. Don’t forget to check them regularly, as you can never be sure when free Lycamobile codes might be waiting for you! Buy now online at www.lycamobile.co.uk. When my niece went of travelling around Europe, her mum was worried that she wouldn't be able to stay in touch. Then we discovered a Lycamobile voucher online. Lycamobile offers great rates on international calls and texts between 19 countries around the world – all via a free SIM available at lycamobile.co.uk. I used my Lycamobile codes to get a fantastic deal on some top up credit for my niece to use so she can call home from her adventures. So why not stay connected for less with a Lycamobile offer?